Food Market Hub Central Kitchen Solution is designed to automate lot’s manual process for Restaurant and F&B related field. Resell Margin – One of common issue of central kitchen is they need to resell bulk purchased products to outlets at very low margin. However, they didn’t update the price frequently and most of the cases, they are selling cheaper rate than cost from supplier to outlet. This make the central kitchen always running at losses. Barcode – Food Market Hub support production batch barcode. Barcode can help central kitchen to identify right product and right batch to supply to restaurant to make sure no expired and older batch send to outlet follow FIFO method. 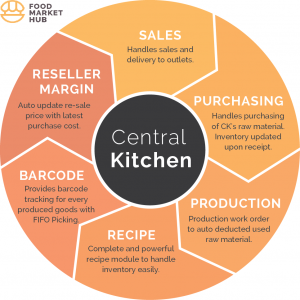 Recipe – Food market hub central kitchen solution support recipe with yield feature. It help to identify the overhead and wastage. Sales – Food market hub central kitchen solution sales module is support through mobile apps. All outlets order to central kitchen through single interface mobile apps which allow outlet to order to central kitchen or supplier same time. System will smart enough to identify which product to send to central kitchen or supplier.